Here's a map of the coast of Maine & our route for this post. Wednesday June 14, 2017: It was another beautiful morning in Camden and we are feeling this weather could become habit forming. We ventured over to the dinghy dock around 0900 for a little exploring around downtown Camden before meeting up with Bob and Jan for brunch at Boynton & McKay Restaurant. It was a fine recommendation from Charlie, a very friendly and helpful staff member at Wayfarer Marine. Upon entry, Fran and I were studying the blackboard menu when three friendly bikers whose dolled up Harley Davidson’s were out front, spoke up and raved about their breakfast choices. Their recommendations influenced us to order the “Two Eggs & Slow Cooked Beef Brisket on a Bed of Local Greens”. Fran also ordered their Blueberry Pancakes and Crispy Bacon and as is our usual practice, we shared the choices 50/50. What a first class breakfast. I’m making myself hungry again, just writing about it. Afterwards, we made a brief stop at the Camden Yacht Club dock to rinse off a rather thick layer of pollen on our decks, followed by a holding tank pump out at Wayfarer Marine and then we headed off to Rockland, Maine, a further 9 nautical miles down the western shore of Penobscot Bay. Boating friends Laurie and John on Nordic Tug “Mirto”, whom we’d met last summer in Rimouski, Quebec had called us recently to see if we could meet up. They keep their boat in Rockland and they were about to head out for a week of cruising in Penobscot Bay. They very kindly offered to let us use a mooring ball they have that was not in use this week and upon arrival in Rockland Harbour, we spend a while cruising up and down the aisles of mooring balls looking for one with their name on it. We are still learning how to approach and connect to mooring balls and this attempt was not the most elegant, but we managed. Thursday June 15, 2017: The sun is shining again this morning, putting smiles on our faces. 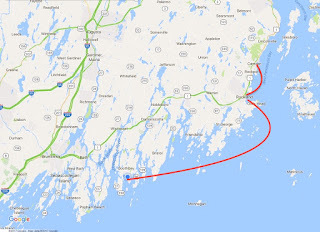 Rockland is the home port of a number of the great Windjammers in Penobscot Bay and there was one in particular we were interested in seeing - The Heritage, a 95 foot schooner, that was in port today. The Heritage is a 95’ long, 24’ wide schooner build by Captain Doug Lee and launched in 1982 as a purpose built vessel to accommodate passengers in comfortable lodgings while coastal cruising in Maine and giving customers an authentic schooner sailing experience. 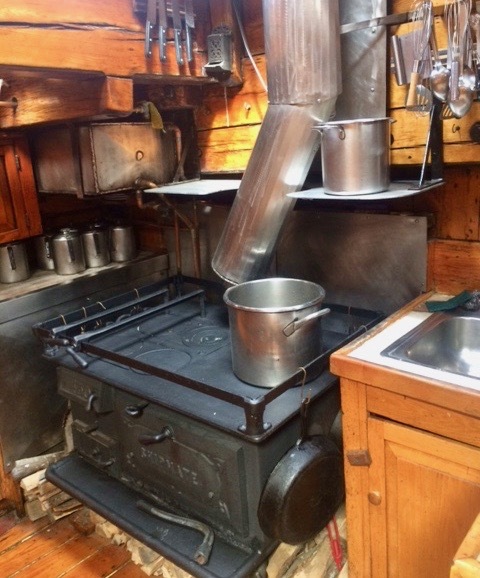 Unlike some of the older, converted “working boat” schooners, the Heritage has full headroom and plenty of below deck space for comfort. Her more traditional elements are, she operates without a motor (they use one of their tenders with a motor as a “push boat”); they cook for the 36 guests and 9 crew on a wood burning cast iron stove/oven and the sailing rig is an all authentic traditional schooner rig. We had a fantastic one week cruise aboard The Heritage in 1997, 20 years ago this summer. After breakfast, we headed off to see the Heritage and found three crew aboard her on their day off. Captains Doug and Linda were not on board, but the crew kindly invited us aboard for a visit and we got to look about and marvel at how well she has been maintained. At 35 years old, she looked magnificent. Wandering about her decks made our hearts beat just a little faster imaging her under full sail making good speed in a 20 knot wind…. Afterwards we headed off to Journey’s End Marina to find John and Laurie aboard Mirto. Later that morning, Wings arrived in port and the six of us went off to lunch at Cafe Miranda for a wonderful meal. We are continuing our tradition of trying out the local chowder along the coast and today’s Haddock Chowder was right up there with the best. Over lunch John and Laurie answered all kinds of our questions about our route down to New York and up the Hudson River that will be very beneficial in the weeks to come. It was great to be able to spend these few hours together with John and Laurie and we’re hopeful they will make the trek to Georgian Bay and the North Channel in the next season or two from now. We spent the balance of the afternoon exploring Rockland and picking up a few provisions, including a magnificent, small blueberry and peach pie with a crumble topping from the Atlantic Bakery Company. Wow, what a treat that was. Friday June 16, 2017: As we contemplate moving out of Penobscot Bay and moving further down the coast of Maine, weather forecasts become more important as the open ocean conditions need to be taken into account. Today looks like the best travel day of the next few days so we were off our mooring and under way by 0645 hours for a 37 nautical mile run to Boothbay Harbour, under cloudy skies with a light drizzle. It was comfortable for the most part with some rolling sections from waves on our beam. The most protected part of the harbour from the forecast strong winds was at the Tug Boat Inn (appropriate for us in a boat named Tug’n). We took a mooring ball very close to their docks for very easy access to the downtown Boothbay. After lunch on board Tug'n, we went ashore to register with the Tug Boat Inn and explore the town. While the town clearly caters to the tourist trade, the streets are loaded with a wide range of boutiques, shops and restaurants and we had a lovely time wondering about and stretching our legs before retreating back to Tug’n the as the rain began falling again. Saturday June 17, 2017: We’d had quite a bit of rain overnight, which is always welcome as it rinses our decks and they demand a wipe down in the morning, making Tug’n look her best. Gradually the sun emerged and it became quite warm as we headed ashore to do more exploring before our pre arranged lunch out. One of our first stops was a shop called Eventide Specialties who carry the most amazing selection of Extra Virgin Olive Oils from around the world, fused and infused olive oils, specialty olive oils and aged balsamic condiments in endless flavours etc etc. Initially, it was a little overwhelming when you stared at the five or six dozen stainless steel containers from which you could draw samples to taste. We really did not know where to start until one of the sales staff took us under her wing and got us a couple of samples and explained the contents of the cards on each one. The flavours caused us to emit many oohs and wows as we sampled their wares, eventually selecting a few purchases for our galley. We spend another few hours exploring downtown Boothbay Harbour before returning to the boat and later, enjoying a game of Sequence with Bob and Jan over a happy hour refreshment. We also discussed the next leg of our journey, deciding on Basin Cove at Potts Harbour for its great protection from strong south east winds and over 2 meter waves forecast for Monday and Tuesday. The entrance to Basin Cove is rather shallow, so we decided we’d be best to enter it closer to high tide than low, necessitating an early start, so we planned on leaving at 0630 hours tomorrow. Sunday June 18, 2017: Happy Fathers’ Day to all the Dads reading this. We were up at 0530 to prepare for our departure, but the morning did not look too promising - fog, thick fog, with visibility of about 200’ at best. At 0600, on a brief radio call with Wings, we decided it was best to stay put. Normally, fog wouldn’t be a big deal. Two boats travelling together, both with their radar going, can provide for quite safe and comfortable travel. 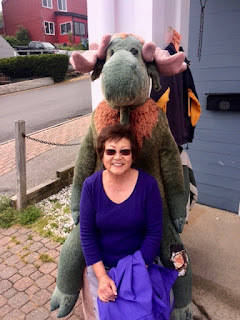 But, here in Maine, with lobster pot floats everywhere, we were nervous about the prospect of running over their floats and getting a line wrapped around our prop shaft, so we decided to sit tight.